Greek yogurt fans will be thrilled to find a new game-changing low sugar, high protein Greek yogurt available from Light & Fit. 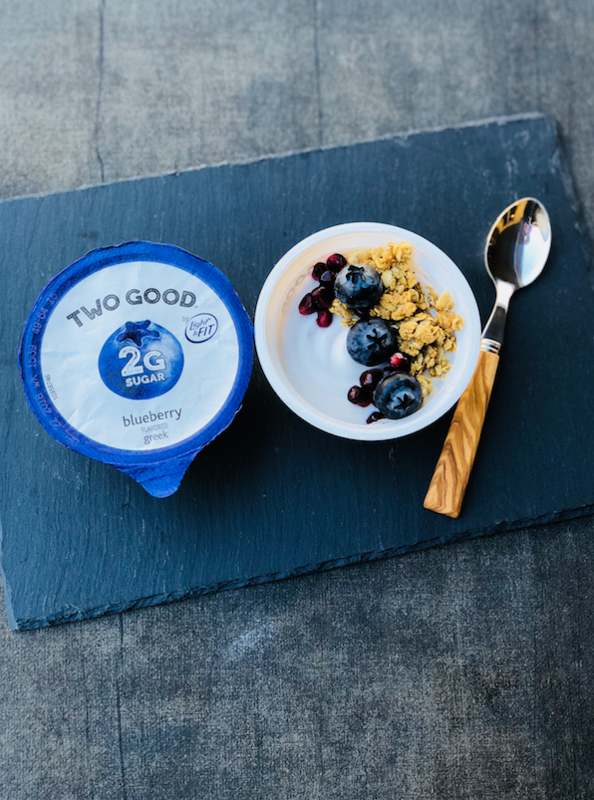 The new Two GoodTM by Light & Fit® Greek yogurt delivers a deliciously thick and creamy taste, with only 2 grams of sugar per cup. 2g of total sugar per 5.3 oz serving – that’s 85% less sugar than average yogurts! Perfect for anyone watching their sugar intake who wants to enjoy Greek yogurt on it’s own, with toppings, or in a smoothie without any guilt! I know I’m always reading labels and comparing yogurts for sugar and added stuff and now I don’t need to because there are four delicious flavors with just 2 grams of sugar and 12 grams of protein! 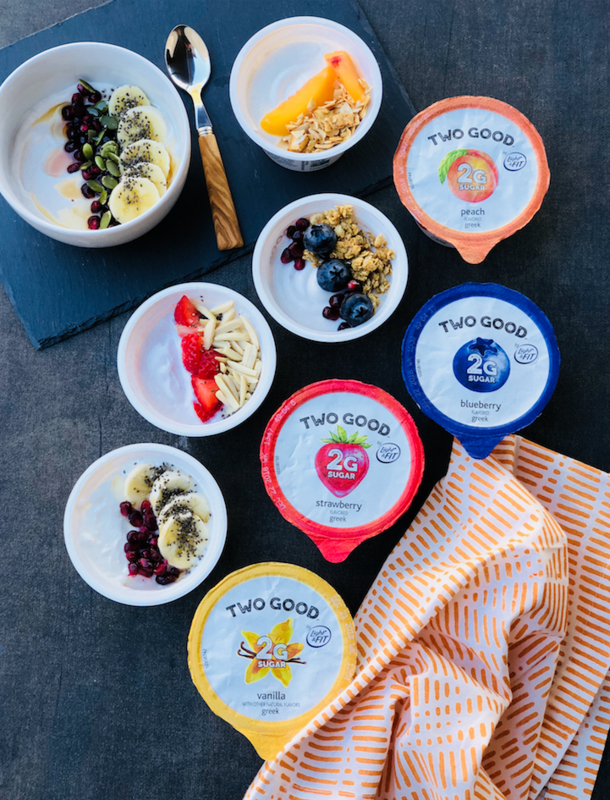 I have partnered with Danone to review the new Two Good Yogurt by Light & Fit that is now available in the dairy aisle at your local Safeway. I picked up the Two Good Yogurt by Light & Fit in vanilla, blueberry, strawberry and peach at my local Safeway to try. I was intrigued because traditionally low sugar yogurts have artificial sweeteners that I don’t care for because I avoid artificial sugars in my diet, and they leave a funny aftertaste in mouth. The Two Good yogurt is sweetened naturally with a touch of stevia, so I wanted to see if it would have that funny aftertaste, but it did not! The yogurt does have the slight tartness you get from any Greek yogurt, and the flavors are definitely more subtle than other Greek Yogurts, but they were delicious! One other benefit of the yogurt I noticed is that it could be a great alternative if you are lactose intolerant. Because the lactose is mostly removed during the filtration process, this yogurt has a low amount of lactose, which is awesome for lactose-intolerant folks like me. I sampled all four cups of yogurt and did not get a tummy ache. YEAH! 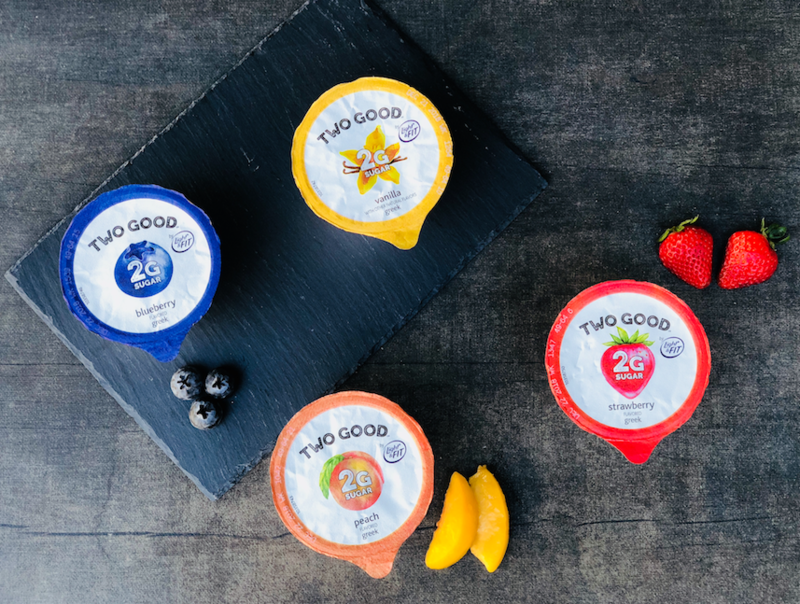 The yogurt is made with cultured reduced fat milk, water, less than 1% tapioca starch (a natural thickener), natural flavors, lemon juice concentrate, gellan gum, stevia leaf, fruit and vegetable juice concentrate (for color), sea salt and active yogurt cultures. One ingredient that I had to look up is gellan gum, which is a new ingredient to me, but gellan gum is a vegan food additive that is produced through bacterial fermentation that helps yogurt achieve it’s smooth and creamy texture. 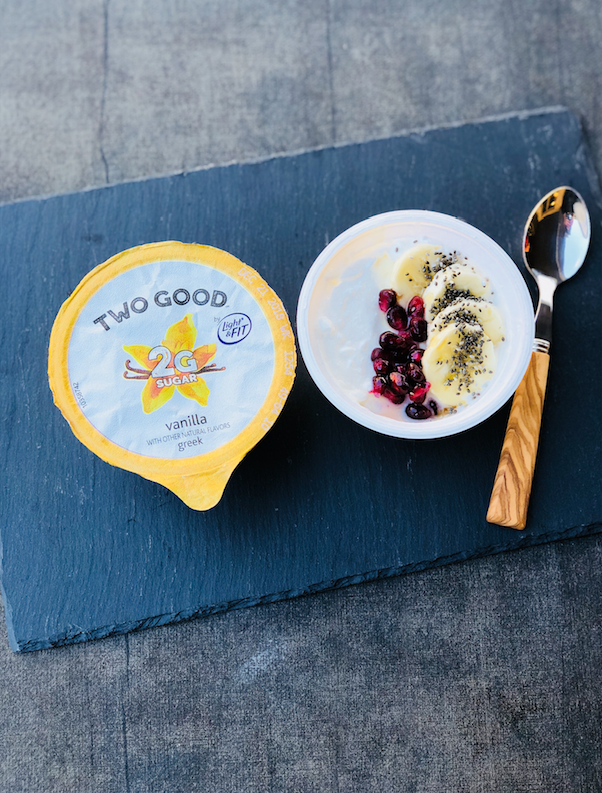 The Two Good Yogurt Vanilla flavor has a thick, creamy texture you can expect from Greek yogurt with a delicious hint of vanilla flavor. It’s delicious on it’s own, or as the perfect base to add granola, fresh fruit or a nut butter. The 5.3 oz cup contains 80 calories, 2 grams of fat, 3 carbs, 2 total sugars and 12 grams of protein. I made a yogurt granola bowl with the vanilla yogurt topped with organic granola, almonds, blueberries and some chia seeds and it was delicious. 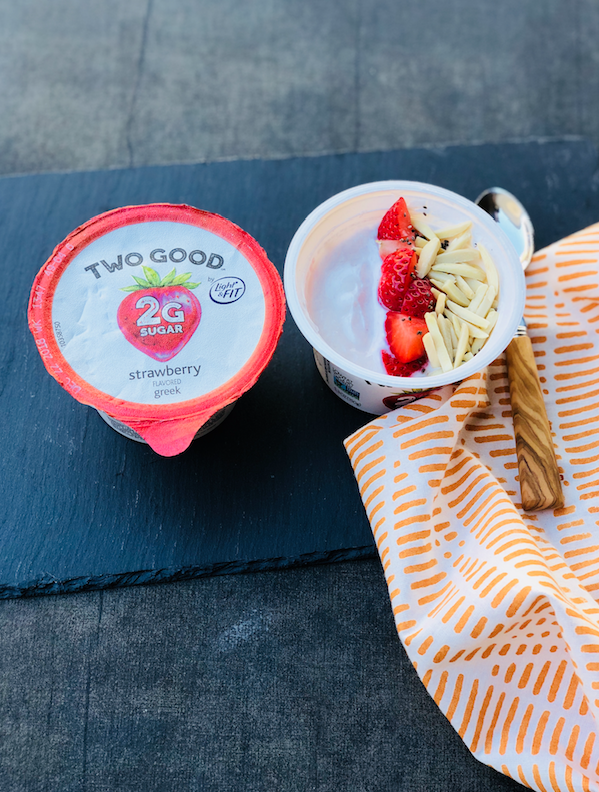 The Two Good Strawberry Yogurt was delicious, creamy, and smooth with a subtle strawberry flavor. It had a slight tart bite to it, but mostly it tasted sweet, so I was surprised that I got such a sweet flavor profile with only 2 grams of sugar. Perfect on it’s own, or in a smoothie where you want the extra protein without added sugar! The 5.3 oz cup contains 80 calories, 2 grams of fat, 3 carbs, 2 total sugars and 12 grams of protein. The Two Good Blueberry Yogurt was also thick, creamy, and smooth and had a pronounced tartness from the blueberries. It was not overly sweet and had a nice refreshing tart blueberry flavor. I served it with granola, fresh blueberries and pomegranate arils and it was delicious. The 5.3 oz cup contains 80 calories, 2 grams of fat, 3 carbs, 2 total sugars and 12 grams of protein. 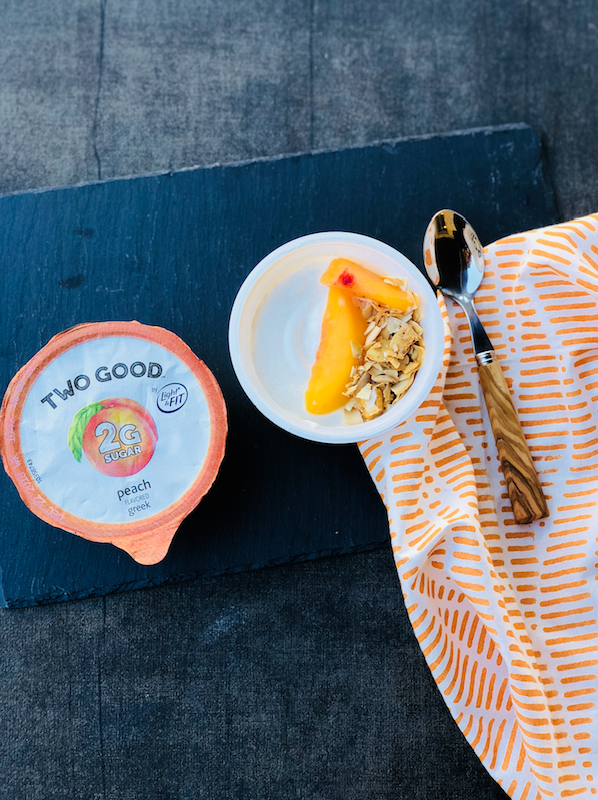 The Two Good Greek Peach Yogurt had a delicious subtle peach flavor, it was also thick, creamy and smooth and it also was not overly sweet. Perfect on it’s own, in a smoothie bowl, or with toppings. The 5.3 oz cup contains 80 calories, 2 grams of fat, 3 carbs, 2 total sugars and 12 grams of protein. I always try to watch my sugar intake, and especially for my kids, I find traditional yogurts have a ton of sugar, so this new yogurt is a fantastic alternative. The kids have already devoured the 8 cups I bought and asked me to buy more! I would love to see the Two Good yogurt available in a plain flavor to use for making my traditional Greek Tzaziki Sauce and other savory yogurt based dips as those cannot be made with flavored yogurts. Hopefully that is coming soon! 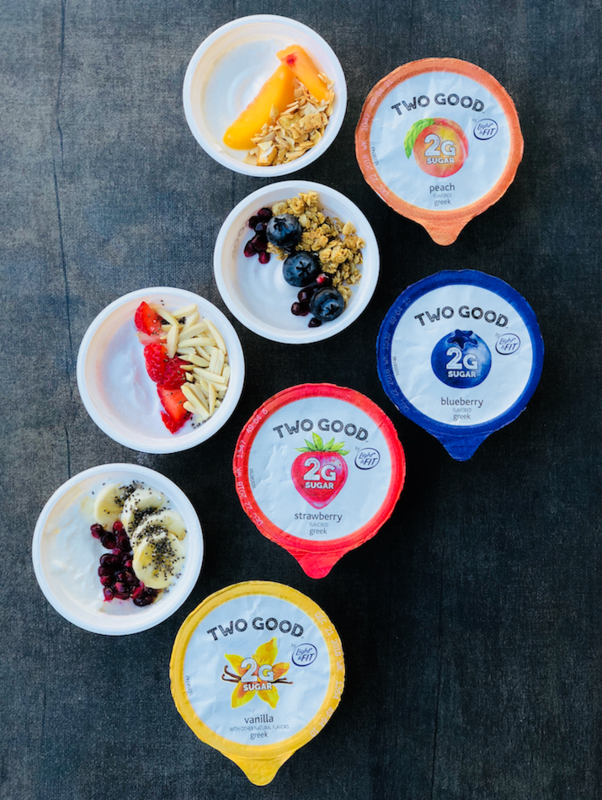 The Two Good Yogurt by Light & Fit is available at Safeway in the yogurt aisle and retails for $1.59 a cup. Pick up each flavor and let us know which is your favorite! This is a sponsored post by Danone to introduce you to the new Two Good Yogurt by Light & Fit. As always, opinions are my own and I appreciate and encourage your support of the brands that make this site possible. I love it but can’t seem to find an expiration date on the ones I bought? Can you tell me where that is? It’s on the top of the label around the edge in a very light sliver or white text. Hi Marcia, The expiration date is located on the top of the label near the edge in a faint white/silver text. Too “XPENSIVE”!!!!!! Carbmaster Yogurt only has 2g of sugar and only cost $.40 for 6oz which is plenty. The Mixed Berry tasted like watered down fruit drink. If you add granola or fresh fruit it defeats the purpose of less carbs. I monitor my carbs due to diabetes. I would not buy again and stick to the Light and Fit yogurt with a little more carbs but better flavor. I found the yogurt to taste as though it has a artificial sweetner. I’m trying the vanilla flavor one and if you had fruit and granola in it it would probably eleminate that. All in all I like that its high in protein and has less sugar. Thumbs up for me. First impression tasting this yogurt was that there was some type of artficial sweetner for the sugar. The taste was prominent. Reading the label I saw the ” added sugar” and “blueberry flavored” ingredients. Overall I did not like the taste but I liked the idea of 80 calories and 2 GMs sugar. I figured it is a healthy step in the right direction and I can enhance the flavor with natural fruit and other wholesome goodies. Thank you for your feedback. The yogurt is sweetened naturally with stevia and contains no artificial sweeteners. I agree that it’s not overly sweet, so adding natural fruit or nuts is a great idea! I am eating one right now! I was skeptical with such low sugar, but it is really good! Super excited for a new low sugar Greek yogurt. Can’t wait to try this! Thanks for the review! This yogurt sounds delicious, can not wait to try it! Sounds intriguing. Love that it only has 2 grams of sugar. Can’t wait to try it!